May 22, 2014 – In a breakthrough discovery at the Children’s Medical Center Research Institute at UT Southwestern (CRI), a research team led by Ralph DeBerardinis, M.D., Ph.D., has taken a significant step in cracking the code of an atypical metabolic pathway that allows certain cancerous tumors to thrive, providing a possible roadmap for defeating such cancers. Published in Cell Reports, and following up on Dr. DeBerardinis’ landmark finding in 2011, this most recent discovery identifies the triggering mechanism that plays a key role in causing a series of energy-generating chemical reactions known as the Krebs cycle to run in reverse. 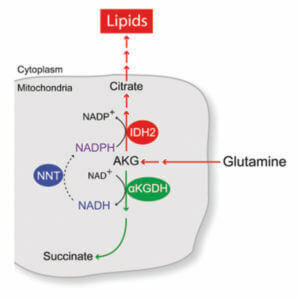 “With this finding, we have learned there are particular enzymes that work together to enable the reverse pathway to function, much like the tiny gears that turn in opposite directions to power a mechanical clock,” said Dr. DeBerardinis, director of CRI’s Genetic and Metabolic Disease Program and associate professor in the Department of Pediatrics and the Eugene McDermott Center for Human Growth and Development at UT Southwestern Medical Center. Dr. Andrew Mullen, a former graduate student in the DeBerardinis lab who is now a postdoctoral fellow at the Whitehead Institute for Biomedical Research, was first author of the paper. Other CRI and UT Southwestern researchers involved in the study were Dr. Zeping Hu, Xiaolei Shi, Dr. Lei Jiang, Dr. Lindsey Boroughs, Dr. Zoltan Kovacs and Dr. Dinesh Rakheja. Scientists from Northwestern University and the National Cancer Institute also participated. The project was supported by grants from the National Institutes of Health and the Welch Foundation, and donors to the Children’s Medical Center Foundation.